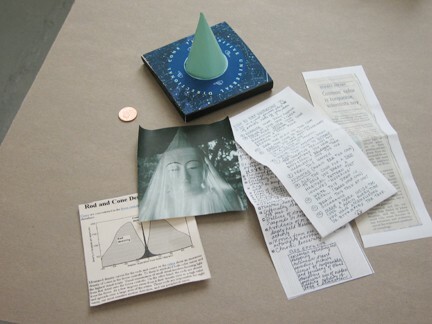 The Positive Universal Directional CONE is a meditation tool. It manifested as an ally on a site specific project in Tuscarora, Nevada. The CONE is always in alignment with the positive pole and can not be dissuaded from this intrinsic affinity. The PUDC works to discover harmful forms of chronic hovering in which sufferers do not believe they are connected to the earth and her field but adrift in mind and story without anchor. Just as Bumadevi touched the earth and stood for Siddharta as he transformed - so the CONE as ally helps realign your root chakra. This is enhanced through meditation and stillness practice. Affix the CONE to the top of your computer screen or dashboard of your car even bicycle handle bars to prevent this etheric drift.